Monday I had a pretty good solo swim. I have been really strong in these workouts recently. Tuesday it was hot, hot, hot in Dallas. The good news was the 800 was late in the evening. The bad news is that it was still north of 90 degrees. I ran in the next to last heat with mostly high school boys. I pretty much ran the entire race right on the heels of this one kid. I almost passed him on the last curve. But once we go on the final straight - he dumped me. Still I posted my fastest 800 of the season. Wednesday I felt real good, so I ran my usual eight mile loop in around 65 or so. However, it was clear later that I did not do good job with the sunscreen. I felt like crap Thursday and Friday. Thursday, I decided I had better no push it so I just did some strides. Friday I did a pretty long endurance workout with Ron and Harold. After the swim, though, I started to feel better. Saturday Morning it was still blazing hot. I went to SMU to do my track work. I must have lost 10 gallons of water in sweat. Somehow I managed to do a pretty good workout in spite of the heat! Sunday I hooked up with Terry at ODarkThirty. Terry was on a short leash for time, so we did the old Fairview loop. I rode Terry back to his house and then I continued down to Hilcrest and LBJ and back for a solid 60 miles. Sunday June 13: Fairview, back to LBJ (Ave 16.8, CAD 81, 3:34 ride time) 60.3 miles bike. 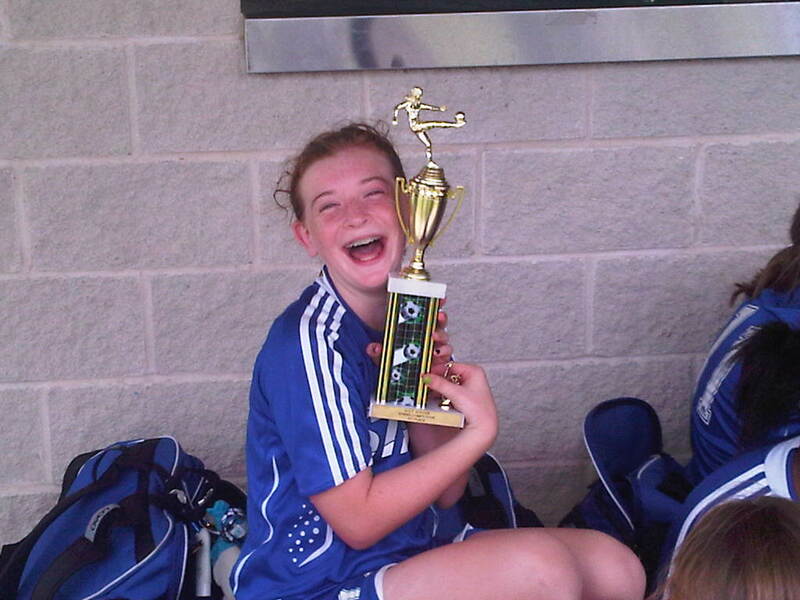 Logan's soccer team, Sting99 Blue, won the Waco HOT Spring Competitive Soccer Tournament this week. Logan was ecstatic! Monday was Memorial day, and as such I hit the gym early for a nice solid swim. It felt really good after last weeks poor swim effort. Tuesday was the track meet. It was 95 degrees and I had a mile to run. I was in the 5 min to 5:35 heat. Right at the gun I jumped out to the lead, and no one else seemed to want to take control. I ran very comfortably turning a 75.66 for the first lap. (Coach Vaughan sez too fast!) I hit the second quarter in 2:35.04 (79.38). I knew we had slowed considerably, but I was still running alone in front. I continued to focus on working the back side and when I came out of the turn I really tried to push. I came thought the 3/4 mile in 3:57.77 (82.72). I knew I had to push harder. At the 200 to go I could see some shadows getting closer. I held them through the curve and then pushed as hard as a could on the home stretch finishing having lead wire to wire in 5:16.97 (79.20). I was pleased with the effort given that I had no help; it was hotter than hell and I went out too hard! The next morning I flew to Austin and did a nice 8 miler there, before missing my flight home. Instead I drove home, got in late and decided to work from home on Thursday. Thursday noon, I jogged over to Breckinridge Park and knock out some 60s intervals. Friday I swam with Ron, Todd, and Harold. Like Monday I was really strong. Saturday Morning I headed to the track to do 400 Pickups with Coach Vaughan. It was really, really hot, but I did a pretty consistent set. Sunday morning I managed a long bike ride, doing the WRL, Sunnyvale, Rowlett loop. Tuesday June 1: Lukes All Comers #3 The Mile 5:16 5.75 Miles Run. Sunday June 6: Solo Bike WRL, Mesquite, Sunnyvale, Rowlett Loop. (Ave 17.4, Cad 85, 3:29 Ride time) 60.6 miles bike.